The HairMax Laser Comb Prima 7 by Lexington International is the first FDA approved medical device for treating hair loss. This is an electrical device that looks like a brush. It is a low-level laser that stimulates the hair follicle to breakdown DHT and regrow hair. The key to the effectiveness of the HairMax Laser Comb lies in the stimulation of the hair follicle. When the hair follicle suffers from poor blood flow and the buildup of DHT, the hair follicle growth cycle diminishes and eventually stops. The HairMax Laser Comb uses laser phototherapy to stimulate the hair follicle to continue to grow. It increases blood flow to the hair follicle and breaks down the buildup of DHT in the follicle, helping the hair follicle restore to a healthy hair cycle. The HairMax Laser Comb represents over two decades of research and development. Seven double blind clinical studies have been performed on the device. The clinical studies conclusively prove that treatment with the HairMax Laser Comb provides hair growth that is comparable to Propecia and minoxidil. Over 93% of men and women in these studies experienced significant hair growth. This product can be used by men and women and has been shown to work on the entire scalp, including the hairline.. There are other low-level lasers on the market but not all lasers are created the same. Lexington International is the only company that has performed clinical trials to show that its laser works to stop recession and balding and to stimulate hair regrowth. And they are the only one that has FDA approval for selling this device as a viable hair loss treatment. It is this website’s opinion that this is a great device to use injunction with other treatments. Lexington recommends using the device for about 15 minutes three times a week. The HairMax Laser Comb is the first and only home use medical device cleared by the FDA to treat hair loss and promote hair growth in both men and women. Domestic and international shipping is available. Price includes the laser comb, cradle, and owner’s manual. My experience and opinion on this product: In the entire world there are only three products that are FDA approved for hair loss and this is one of them. FDA approved means it has gone through extensive clinical testing to prove its claims and because of that the FDA grants them the right to state their claims. However, I have used this device multiple times with no success. I have even used a $27,000 commercial head device for months and used it 5 days a week and didn’t get any results. However, it does work for people and I have seen the results. Part of my problem is I am impatient and hate sitting there each day with this device on my head. I recommend this device for those that need the hard FDA claims about the product to give them the confidence that it works. However, I recommend using this device as a complement or in addition to a topical hair loss treatment, like 4hairlossMen and 4hairlossWomen, and not as a standalone treatment. Spending $195 may seem like a lot of money at first. But this is one of only three treatments for hair loss that has FDA approval. The other two are Propecia (Finasteride) and minoxidil, which both require monthly refills. 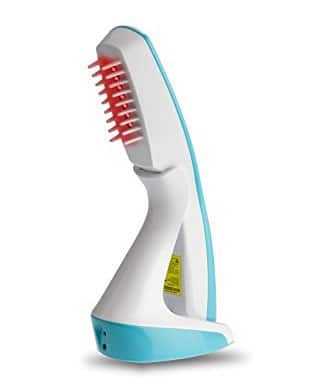 The HairMax Laser Comb is a one-time purchase that has a long useful life. When you look at it that way it is a good value. Of course, like me, you may use more than one treatment for your hair loss.